Dragon’s Domain Records presents the world premiere soundtrack release of TIME WALKER, to be distributed through buysoundtrax.com. TIME WALKER features music composed by Richard Band for the 1982 science fiction/horror film directed by Tom Kennedy, written by Tom Friedman and Karen Levitt, from a story by Jason Williams and Tom Friedman, starring Ben Murphy, Nina Axelrod, Kevin Brophy, Robert Random, James Karen, Sam Chew, Jr., Austin Stoker, Darwin Joston, Shari Belafonte, Antoinette Bower, Gary Dubin, Greta Blackburn, Melissa Prophet and Jack Olson as the Time Walker. Released in 1982, TIME WALKER is an ambitious hybrid of classic monster movies like the MUMMY and marooned alien tales like E.T., sprinkled with tropes of the popular slasher films of the day like HALLOWEEN. The story is set in motion when University professor Douglas McCadden (Murphy) unearths an unusual sarcophagus hidden in King Tutankhamen’s tomb. McCadden returns to his campus in Southern California with the sarcophagus and opens it with the assistance of his archaeology students. Translating the cartouche on the lid of the sarcophagus, he learns that the occupant is named Ankh Venaris, which, according to his assistant, Susie (Axelrod), means ‘noble traveler’. McCaden will learn later that Ankh Venkaris is ‘not from around here’. He’s an extraterrestrial traveler who was injured during a crash landing in ancient Egypt during King Tut’s reign. After a first contact that goes horribly wrong, Ankh Venaris was sealed into King Tut’s tomb to keep the populace safe. The plot begins to thicken when technician Peter Sharpe (Brophy) takes high-powered x-rays of the body, which has the unforeseen side effect of reviving the mummified alien while also activating a formerly dormant flesh-eating fungus that coats the mummy’s bandages. Later, Sharpe’s x-rays reveal a cache of spherical crystals hidden in the sarcophagus’ hidden compartment. Sharpe removes the crystals and takes a new x-ray to conceal his theft. Unknown to Sharpe, the crystals are a power source for Ankh Venaris and essential to his plans to return to his home. While Sharpe tries to profit on the crystals either by trying to sell them or using them to charm the co-eds out of their clothing, the mummy goes on a violent shambling rampage as he tries to retrieve them. 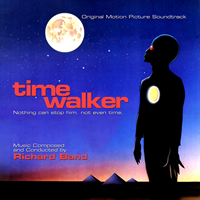 Composer Richard Band became involved with TIME WALKER through an acquaintanceship with music supervisor David Franco, who suggested Band to producer Dimitri Villard. For TIME WALKER, Band favors orchestral instruments, enhancing them with a mix of electronic sounds in what would later be recognized as musical sound design. Most of the music in the film, up until its final climax and resolution, consists of a mix of atonal and fluid musical sound design that mixes new orchestral recordings with synthesized tonalities and textures. But Band does pull the electronics into the background at times to allow for some ferocious action scenes that are symphonically-driven. Dragon’s Domain Records is excited to unearth and present the soundtrack to TIME WALKER for the very first time. TIME WALKER has been produced from the composer’s original elements by James Nelson at Digital Outland, including liner notes written by author Randall Larson. TIME WALKER is a limited edition release of 1000 units. The first 100 copies ordered trough the buysoundtrax.com website will be autographed by the composer at no extra charge.